You get a re-gift tonight, because I said so, but it is still awesome, and perfect gift for your belly on the 5th night of Hanukkah. But first, let's light the candles! Heat about 1/4 inch of oil in a very large fry pan over medium heat. Place cut and peeled potatoes in bowl of processor and chop finely until no large pieces remain. Add onion and chop until uniform. Add salt, matzo meal and eggs and pulse to mix well. Should have the consistency of apple sauce. Place 1/4 cup portions of uncooked latke mixture into hot oil in batches (it should sizzle when some batter is added) flatten slightly and fry until golden brown. Flip carefully and fry other side until done. Eat hot with sour cream and/or apple sauce. 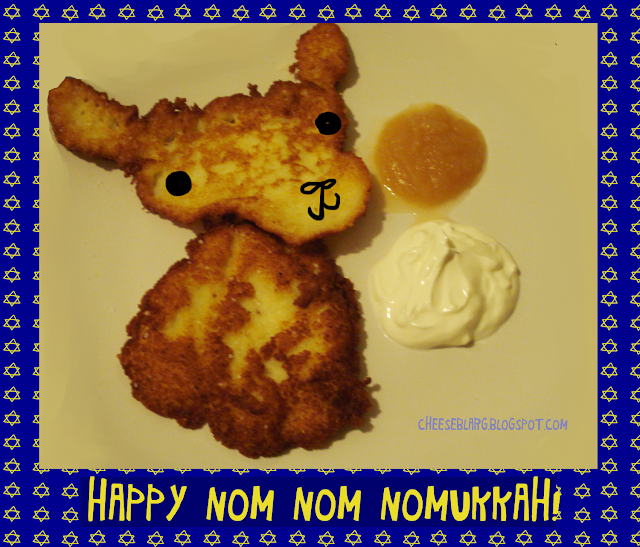 I love latke and I've been trying to make it for about two years now. I have never, at any point, done so without setting off the smoke alarm. Is this part of the process, or am I just a terrible cook? My answer is completely unfunny, but you probably just have the heat up too high. I almost never use more than medium heat on anything I am cooking.